Last autumn I went for a study tour a week to Nice, Southern France. One day after working with photographing and drawing at the Parc du Chãteau I walk home at the Quai des Etats Unis. 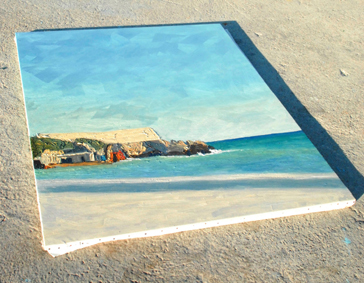 Omar Logang painting on the beach. I went to see what he was painting and became fascinated by his work catching the evening light. We started to talked and it was really interesting to hear about his art and see his paintings. Omar was born in the Southern Sudan into an artistic family. 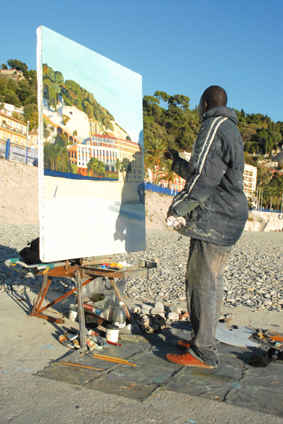 For the past seventeen years Omar has painted in Spain with almost annual visits to Morocco, Mali and the South of France. He constantly searches for scenes of changing light. He works with landscape, figure painting, portraits and city views. Omar Logang has had many regular individual exhibitions in Madrid. He is now starting to be much more widely known and his work forms part of collections in France, Italy, Germany, Untied Kingdom, Russia and the USA.